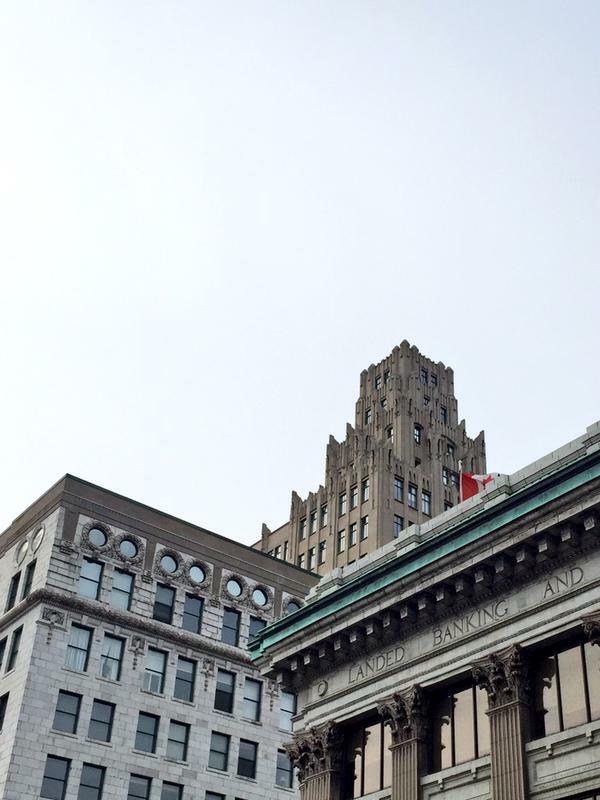 Whether walking, biking, or driving east along York Boulevard, 505 York is hard to miss. The building sticks out, almost alien-like amongst its more subtle neighbours. 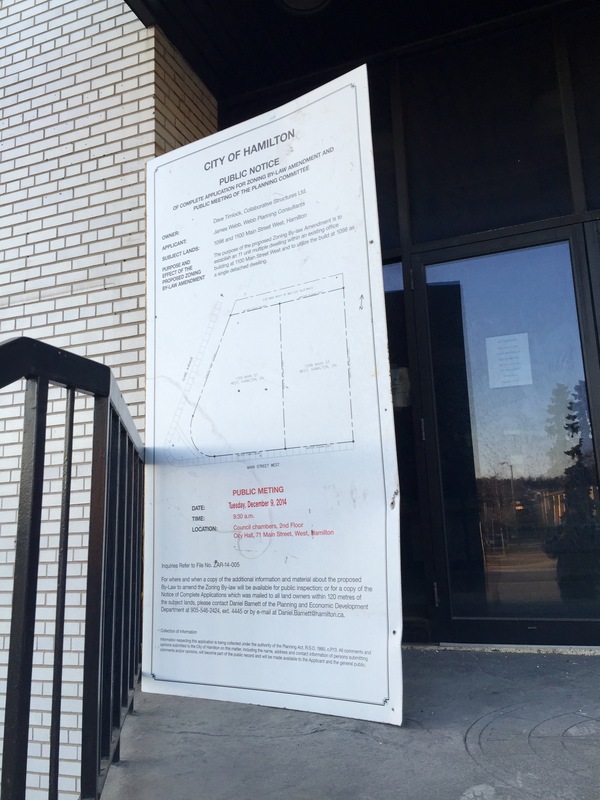 For the most part, its history has been a mystery. Until now. 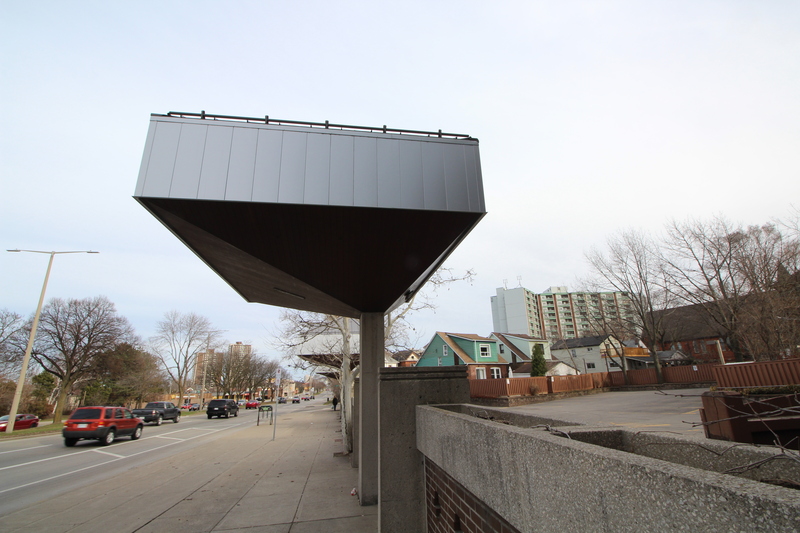 505 York Boulevard was built in 1979 and designed by Leonard M. Huget, an architect based out of Cayuga. 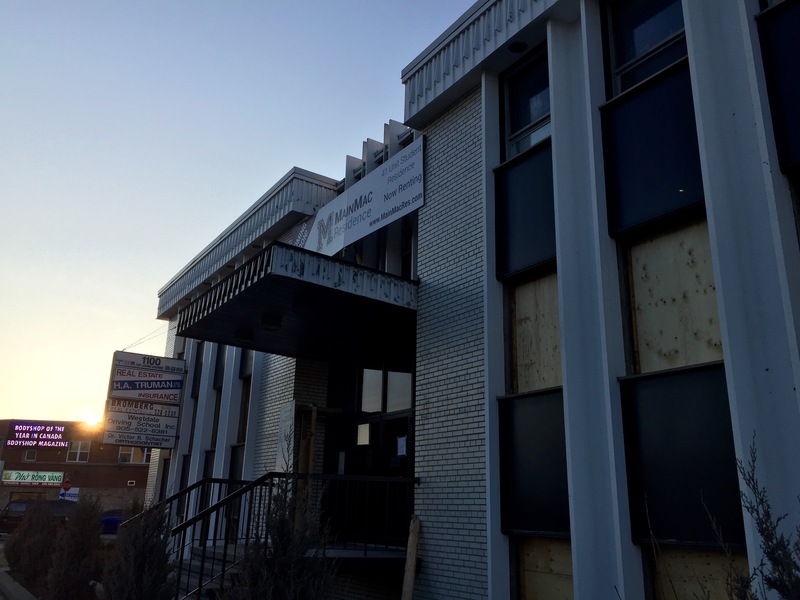 The building was built for the Simcoe & Erie Insurance Company. The design is unique, a modern office building with some post-modern touches. 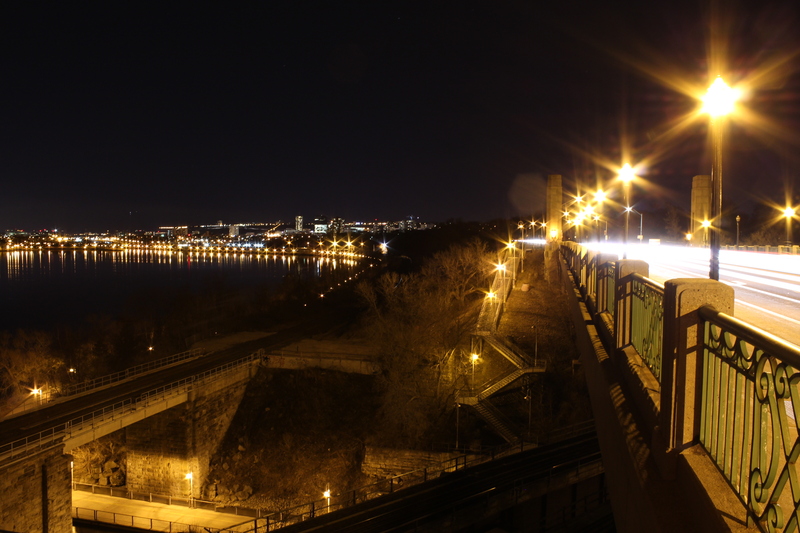 Huget provides responsiveness to the context of the site through his consideration of elevation and scale. 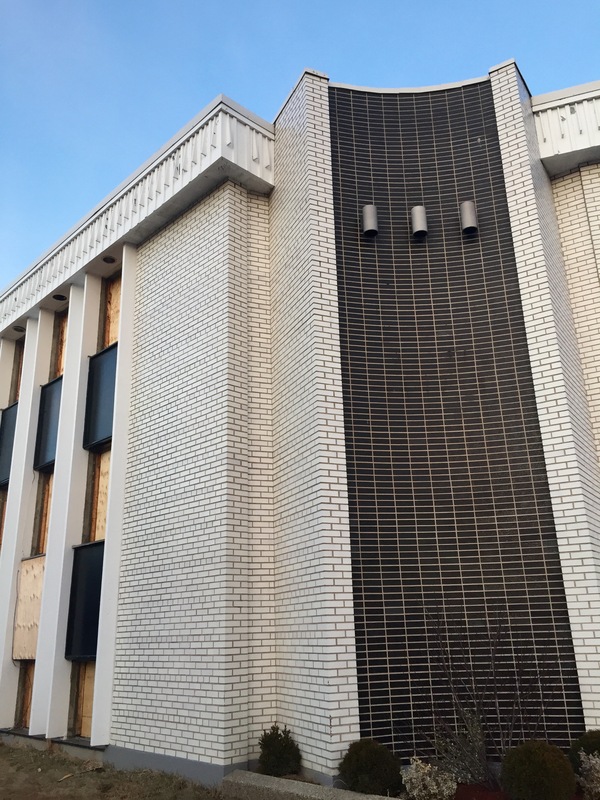 At street level, the façade is composed of precast concrete panels and brick, with a vertical band of windows overhead. On the second floor, the building projects like a trapezoidal-shaped box over the north and east sides, punched with a band of vertical windows. The façade and underside was originally clad in redwood paneling, while the roof was shingled. 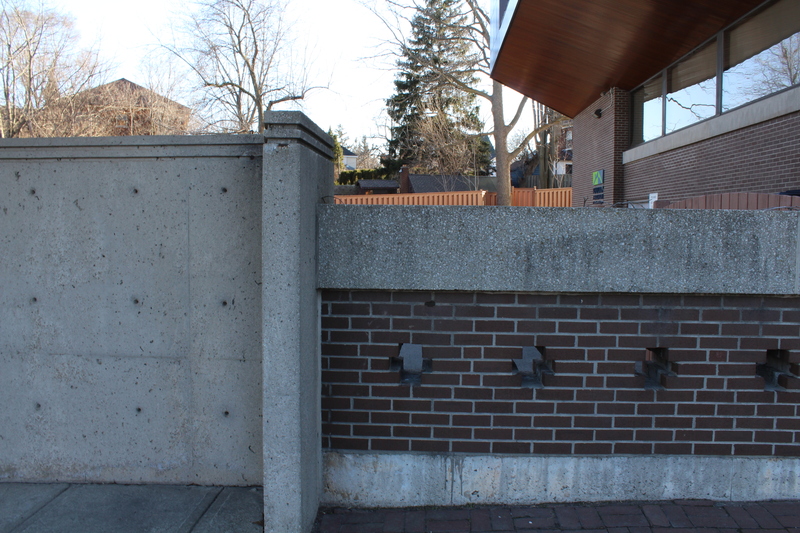 Further east, the building is adjoined to a five foot concrete and brick wall with cruciform holes. 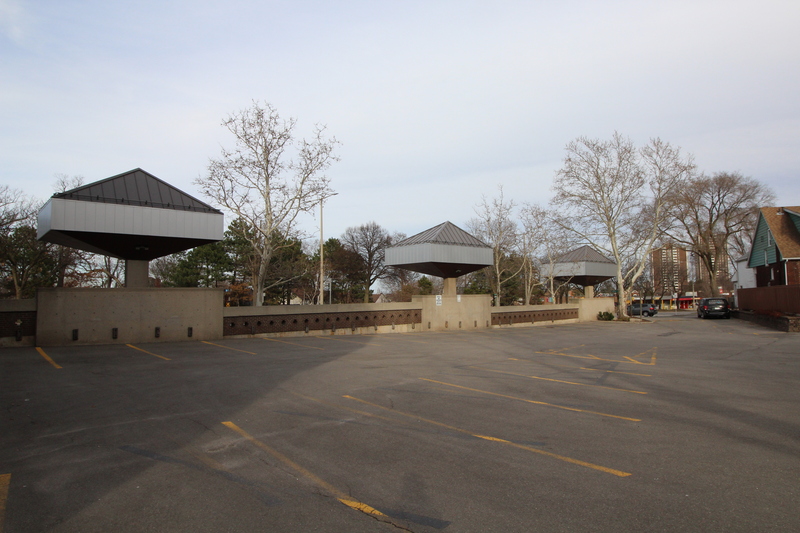 At intervals, three diamond-like geometric canopies cantilever over the sidewalk on concrete columns. Although they appear to be no more than post-modern ornament, they act as trees, providing shade and shelter for pedestrians. Birch trees divide each canopy by a ratio of three to one, although some have since been cut down. The wall hides the buildings parking lot from the street and the canopies provide lighting to the lot through mounted lights. 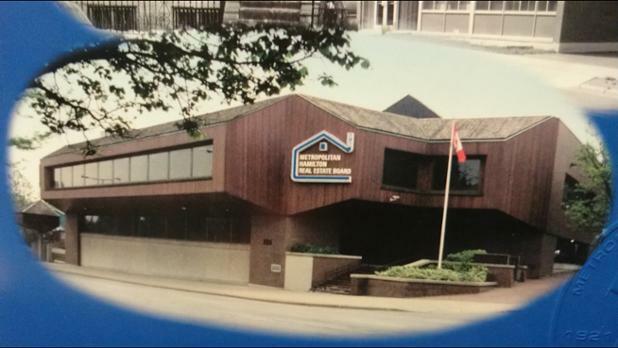 The building was purchased in 1990 by the Metropolitan Hamilton Real Estate Board, now the Realtors Association of Hamilton-Burlington. 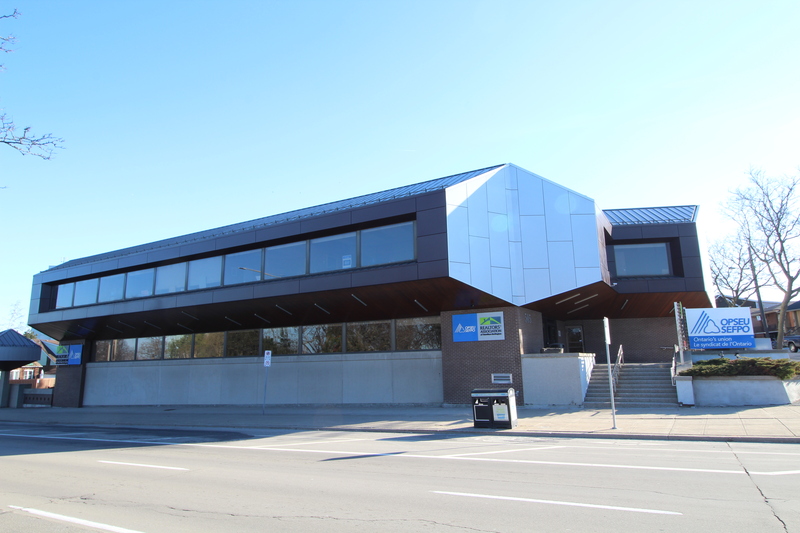 In 2010, it saw an exterior renovation by Chamberlain Construction Services Ltd. 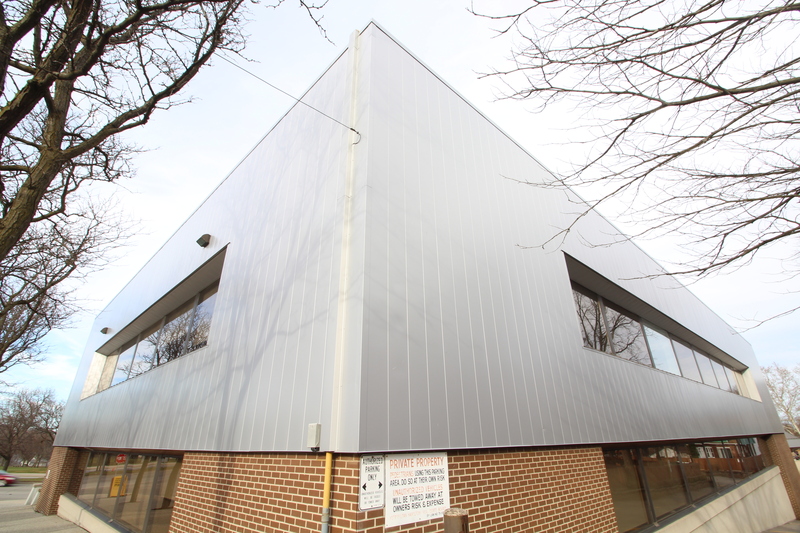 The redwood paneling made way for sheets of steel cladding, while the undersides saw a new accented wood paneling and a standing seam metal roof replaced the dated shingled roof. The planter boxers, which once sat at the ledge of the windows on the north façade, were also removed to complete the contemporary update. 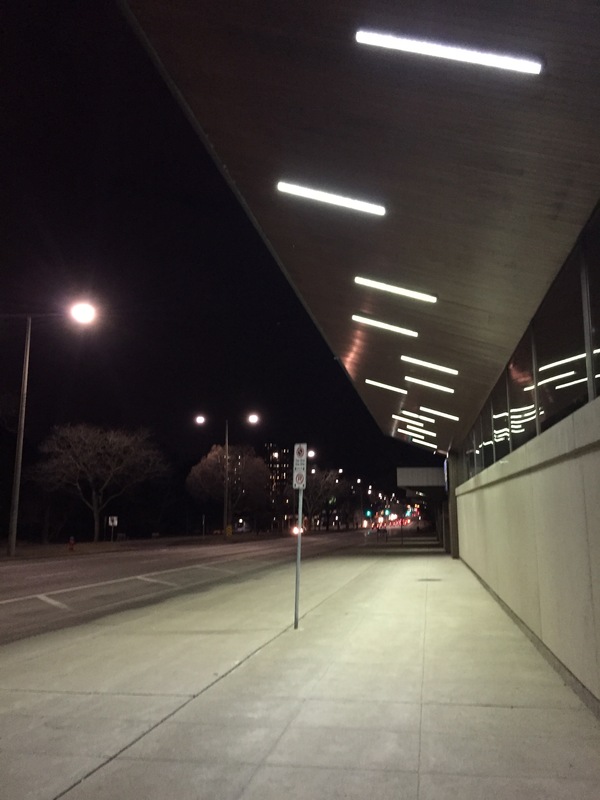 LED tube lights were installed in an offset pattern to the underside of the entrance and north façade, providing a brighter, safer walk for pedestrians along the boulevard. 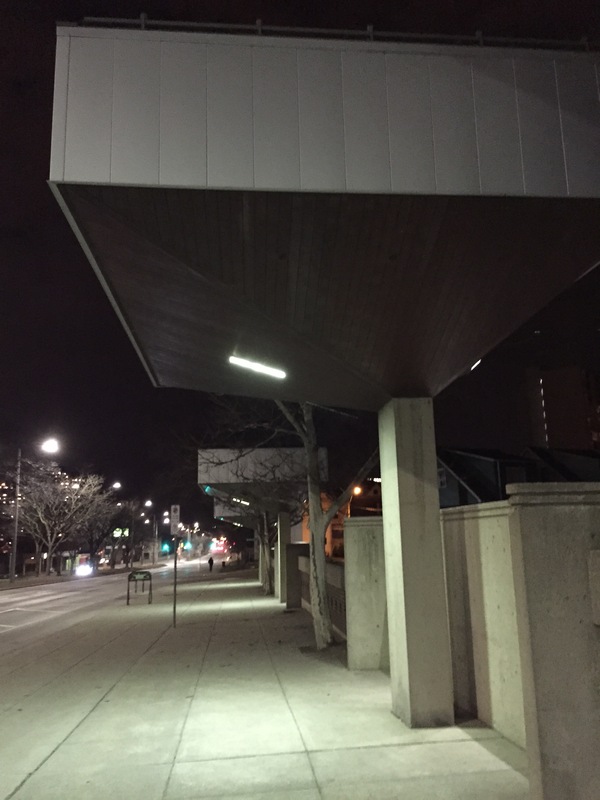 They were also added to the undersides of the diamond-like canopies for an illuminated continuity stretching the whole block. 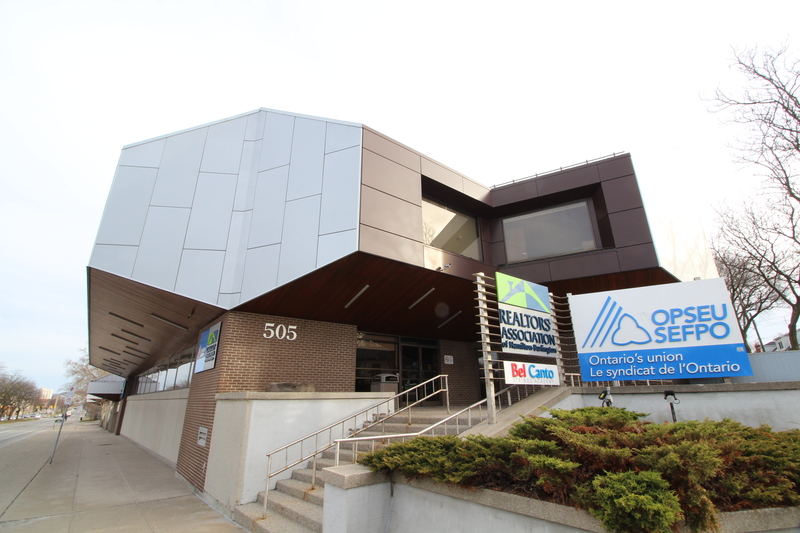 505 York is home to the Realtors Association of Hamilton-Burlington, OPSEU, and Bel Canto Strings Academy. Another notable building of Leonard M Huget is the Haldimand-Norfolk Administration Building in Townsend, Ontario. When it was completed in 1983, the building hailed as state-of-the-art. 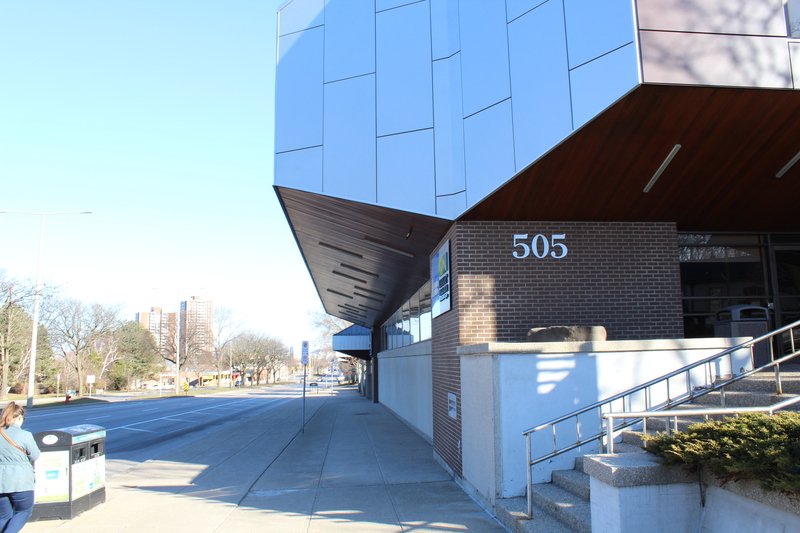 It shares similar aesthetic motifs with 505 York, though the Administration Building is much larger in size. It is now home to the Children’s Aid Society of Haldimand and Norfolk.